It might be nothing, but it is always intriguing when major amounts of stock in public companies start shifting around, especially when it’s owned by senior executives of that same company. Microsoft CEO Satya Nadella, President Jean-Phillipe Courtois and Executive Vice President of Business Development Margaret Johnson have collectively pocketed more than $47 million between July 26 and August 10 through disposing of Microsoft stock. Executives are of course entitled to sell shares to bolster bank accounts, it is after all part of their annual package, but when the three most senior executives sell off such amounts in a small window, the sceptical individuals in society will start looking for explanations. During the period, five Form 4 documents were filed with the US Securities and Exchange Commission, these forms detail instances of named directors are either selling or purchasing additional shares in the company. Three of these documents were filed by Courtois, with one each for Nadella and Johnson. As you can see from the table below, we are certainly not talking about chump-change; in the case of Nadella, it was roughly 30% of his holding. The last time he offloaded cashed in was in 2016, though he still holds 778,596 Microsoft shares. All three offloading shares at a similar time might be nothing more than coincidence, rewarding themselves some summer spending money. Looking at the Microsoft share price, selling shares bang in the middle of two quarterly reports does look like a good time to maximise cash, though the share price has consistently gone upwards at a very healthy rate since Nadella was appointed as CEO. Most might come to the conclusion there is no reason not to assume it would continue to. Since his appointment in February 2014, share price has gone up by roughly 190%. 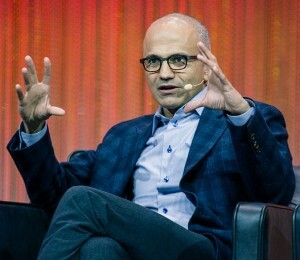 Pivoting more to a cloud orientated business, Nadella was EVP of the cloud business unit prior to assuming the top office, has seen Microsoft reclaim its position as one of the most influential companies in the technology world. During the most recent earnings call, Microsoft reported $110.4 billion in revenues across the 2018 financial year, the first time $100 billion has been exceeded. Cloud and artificial intelligence were the winners in 2018. As CEO, Nadella currently collects a base salary of $1.5 million, while receiving nothing for his position on the Board of Directors. According to the latest proxy statement from Microsoft, executives are paid 7.6% as a base salary, 73.2% as equity and 19.2% through cash incentives. By meeting all his personal targets, Nadella received an additional $7,032,406 in cash incentives over the course of 2017, while Courtois and Johnson pocketed $2,762,884 and $2,168,795 respectively. Of course, the trio might have just preferred to have cash in their bank accounts than subject part of their salary to the sways of the financial markets, however the movement of significant amounts of cash is certainly noteworthy.